Representatives of the Karen National Union are holding a series of meetings with refugees at the nine Thai border camps to inform them about the peace process taking place inside the country. 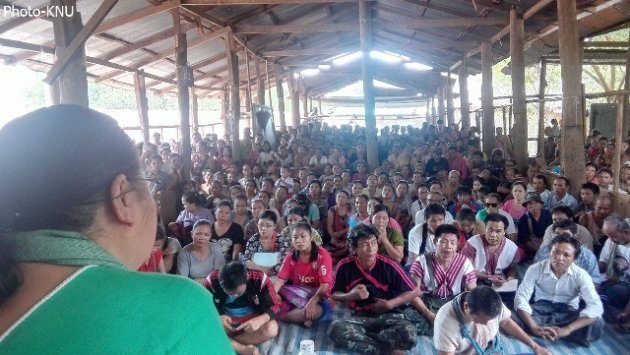 The KNU team, led by Padoh Naw Zipporah Sein, vice chairperson, held a series of public meetings on September 20 and 21 at Mae La refugee camp, the largest of nine on the Thai-Burma border, to try to ease refugee anxieties about the peace process and repatriation. Camp residents said that rumors circulating in the camps about repatriation and camp closures caused refugees a great deal of stress and that the KNU’s Vice Chairperson briefing was helpful. Padoh Saw Liston, who is the vice in-charge of the KNU’s Central Information and Organizing Department, said that officials of the Karen Refugee Committee were there to help explain the situation to the nearly 1,000 people from all three zones of Mae Lae. The KNU’s Padoh Zipporah Sein explained about the development of the peace process and Padoh Saw Liston explained the KNU policy concerning refugee affairs. Now that KNU has signed the NCA with Burmese government and the peace process has been implemented, international aid for refugee camps has been reduced and it has been stated by various government bodies that refugees will be repatriated. Refugees point out that these statements issued without explanations or timeframes have done little to ease their concerns. The KNU’s policy for the repatriation of refugees states that they must have the right to decide their lives for themselves in accordance with international human rights standards. The resettlement and rehabilitation process has to be done within a stable political situation and a guarantee for the security of the refugees. There is also a policy stating the refugees must not be discriminated against, according to KNU. Similar meetings were held at Nu Po camp on September 14 and Umphiem camp on September 15. Naw Zipporah Sein will also attend meetings at the remaining camps along the Thai-Burma border including Mae Rama Luang, Mae La Oon, Tham Hin and Ban Don Yang camps.